What Can I Make With Puff Pastry & Pumpkin Pie Filling? 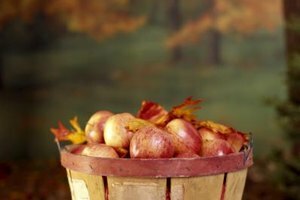 Take advantage of apple season, which runs from August through November, to buy fresh apples locally. 4 What Can I Make With Puff Pastry & Pumpkin Pie Filling? Finger food desserts made with apples end a casual meal in a sweet and simple way. Try a new twist on old favorites with apple-butterscotch brownies or oatmeal cookies studded with apple chunks. Tart Granny Smith apples are best for baked desserts, but if you're preparing a treat with fresh apples, try Delicious, Gala or McIntosh. Make apple fritters to serve as a dessert that doesn't need a fork or a plate. Core Granny Smith apples and slice them into rings about 1/4-inch thick. Coat the slices with batter before frying them in hot vegetable oil. After the fritters drain on paper towels, dust them with confectioner's sugar. If you prefer, drizzle the fritters with a sweet sauce, such as cinnamon or caramel. To make a quick caramel drizzle, melt vanilla caramels in a saucepan with a bit of milk. Combine chopped apples, walnuts, raisins, cinnamon and sugar with enough applesauce to coat them. Add enough cornstarch to thicken the mixture as it cooks inside the pastry. Cut purchased puff pastry sheets into squares. For small turnovers, cut squares measuring 4 inches by 4 inches. 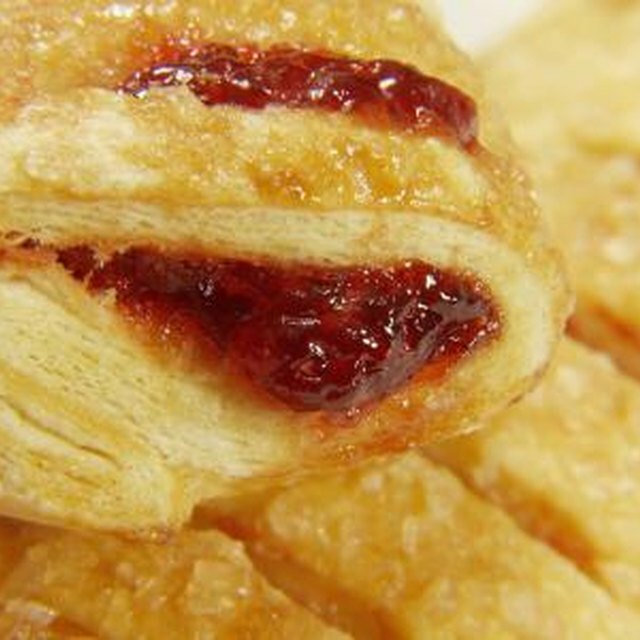 For larger pastries, cut squares measuring 5 inches by 5 inches. Place a heaping tablespoon of filling in the center of each pastry square and fold the square into a triangle. Pinch the edges together, brush egg white onto the top of the pastry, and bake. Chop a large Granny Smith apple and combine it with cinnamon, nutmeg, sugar and raisins. Open a can of refrigerated biscuits, separate them, and use a rolling pin to stretch them into a circle measuring 3 to 4 inches in diameter. Put a tablespoon of filling in the middle of each biscuit. Top the filling with a dab of butter. Bring the sides of the biscuit up and twist them together, sealing in the filling. Bake the mini apple pies in greased muffin tins until they're lightly browned. If you prefer, use frozen pie dough instead of biscuits. Thaw the dough and cut it into rounds measuring 3 to 4 inches in diameter. Whip up a quick and simple apple dessert by slicing crisp apples into wedges. Make a caramel dip by melting caramels with milk, or purchase a caramel dip. For a dessert the kids will love, dip fresh Delicious apples in melted caramels. Add wooden sticks before dipping, and set the caramel apples on waxed paper to cool and set. Make the treats extra special by drizzling them with melted milk chocolate and sprinkling them with chopped nuts. Margaret Morris has a Bachelor of Arts in English with a concentration in creative writing from the University of Pittsburgh. She also holds a celebrant certificate from the Celebrant Foundation and Institute. Morris writes for various websites and private clients. Can I Make Doughnuts From Frozen Yeast Roll Dough? How do I Make Chocolate Covered Peanuts?